For four years, I taught at a branch campus of Penn State on the Pennsylvania/Ohio border, about 30 miles from GM’s Lordstown plant. The plant was producing Chevy Vegas, GM’s supposed answer to the flood of domestic and imported subcompacts winning the market then, in 1972 I arrived in Mahoning County. 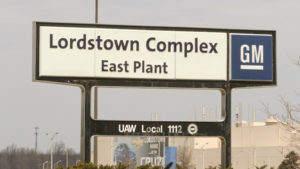 Lordstown was a relatively new plant and its workers, UAW members, were young, a number of them military veterans, likely at a higher percentage than draft age males of the time and certainly attending colleges or universities. Another way of looking at Lordstown is to know that is about the same distance from Kent State University as my classroom — but west. In May 1970, rattled Ohio National Guardsmen, fearful for their own safety, killed four students and wounded nine others in a little more than a minute during demonstrations against the invasion of Cambodia. “Troubled,” “restive,” “work stoppages,” “strikes,” “shutdowns,” “sabotage” were commonly printed and broadcast to describe what was going on at one of northeastern Ohio’s largest employers; and fingers were pointed most often by management at the anti-war demonstrations now in their employ and young resentful veterans. The “long-haired,” etc. description comes from a 1972 Time Magazine piece on the plant. “The Lordstown Syndrome” became a catch-phrase in academic circles and in the media to describe labor unrest. To be honest, I didn’t teach any Lordstown employees during my time at the Shenango Valley Campus, but I certainly was teaching plenty of young veterans — “mill hunky kids” in the words of one of them describing his background to me. Their families, like many of the other students, had worked in the western Pennsylvania steelmaking giants’ plants and in the powerhouse manufacturers factories like Westinghouse that snaked along its rivers. Almost all were the first in their families to go beyond high school. The Mahoning Valley steelworker jobs, across the state border, which had been slowly draining away with shift eliminations, as happened at Lordstown this year, were given their death sentence in 1977 when Youngstown Sheet and Tube shuttered its Campbell Works. The story is probably the same at Lordstown. next post: When in Doubt, Mr. President, You Could Ask TR What His Gut Told Him.